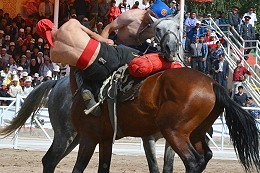 World Nomad Games Kyrgyzstan: live HD broadcast. London, July 2018: Organisers of this year’s World Nomad Games – the planet’s greatest celebration of traditional nomadic sports and culture – are planning to take the spectacular event to a global audience. TV broadcasters and digital platforms worldwide are for the first time being offered the chance to take a live HD signal of the Games, held in the central Asian Kyrgyz Republic, between September 2 and 8. UK-based Integras Technologies Ltd are working with the WNG organisers to maximise international audiences by brokering the sale of international broadcast and digital rights. A spectacular opening ceremony takes place on September 2 at Cholpon-Alta, on the banks of Kyrgyzstan’s Lake Issyk-Kul, to mark the arrival of 3,000 athletes from 77 countries to participate in 37 unique sporting and cultural events. Highlights include archery, falconry, wrestling disciplines and horseback events. Full information about the World Nomad Games is available at www.worldnomadgames.com/en. For further information about international broadcast or digital rights in your territory, please contact Andrew Steele at Integras Technologies Ltd.